Bosch distanced itself from its nearest rival -- Japan's Denso -- in 2008. German partsmakers handled last year's steep market decline better than their rivals on this year's Automotive News Europe ranking of the top 100 global suppliers. Of the top 15 suppliers on this year's list, only seven companies posted higher sales  three German, two American and one French. Sales at Continental AG edged up less than a tenth of a percentage point but that was good enough to push the Hanover-based company into third place ahead of Canada's Magna International, which fell 9.2 percent. Sales at No. 6 Johnson Controls Inc., of Milwaukee, Wisconsin, rose 3.2 percent. No. 8 Faurecia of France saw sales rise 1.4 percent. No. 9 ZF Friedrichshafen AG of Germany posted a 5.5 percent increase. Sales at No. 10 TRW Automotive, of suburban Detroit, rose 2.0 percent. No. 13 ThyssenKrupp of Germany reported a sales increase of 2.0 percent for it automotive business. Plunging new-vehicle sales in North America hurt suppliers there, while the collapse of the European auto market came later in the year than in North America and Japan. Declines in North American and at home hit Japanese giant Denso Corp., which posted a greater percentage sales loss than bankrupt Delphi Corp. Each was hurt by woes at its largest customer. No. 2 Denso's global sales dropped 22.2 percent to $27.76 billion. No. 7 Delphi's sales fell 19.0 percent to $18.06 billion. Denso suffered from Toyota Motor Corp.'s global slowdown, a weaker yen and shrinking vehicle production at its U.S. customers other than Toyota. Toyota owns 22.9 percent of Denso. Delphi, spun off from General Motors in 1999, still gets about 30 percent of its sales from its struggling former owner. In 2007, Denso nearly passed No. 1 Robert Bosch GmbH. Just $460 million in sales separated the top two suppliers. But Denso's deep drop last year combined with Bosch's slight decline increased the distance between the giants. 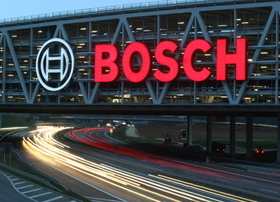 Sales at Bosch fell 6.2 percent to $33.90 billion. The company attributed its decline to a sharp drop in North American sales combined with a significant cooling of its European market. Suppliers were ranked on their global parts sales to carmakers in 2008. Foreign currency amounts were translated into dollars at the average exchange rate for the calendar or fiscal year.